Work: Kajaani Art Museum, Finland. 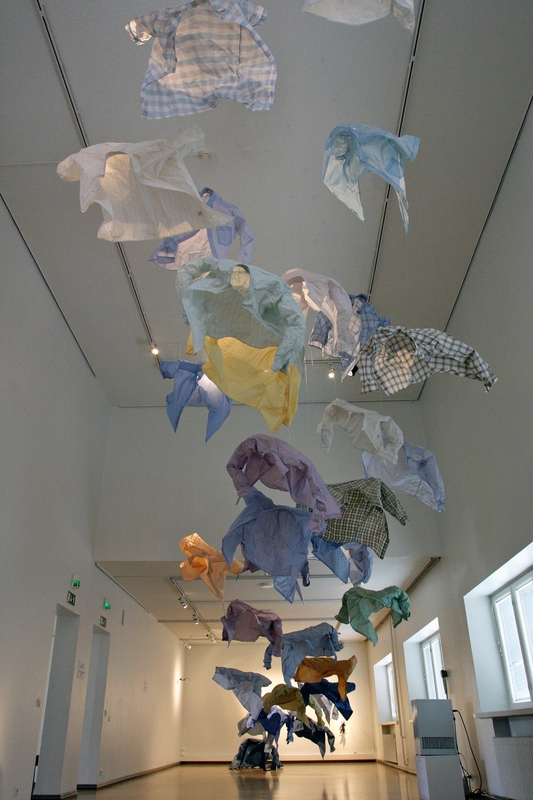 Kaarina Kaikkonen (born 1952) is known for installations that are modest and monumental at the same time – the scale is lofty, but the materials down to earth. Most often she uses recycled materials, such as clothes or paper. The meaning of a piece can arise from the great number and anonymity of the clothes’ former owners, such as in her jacket installations, or from the personal memories and emotions of the people who have used the objects. On the other hand, the jackets, shirts and ties she uses are connected to Kaikkonen’s deceased father, yet their sheer number steers associations towards crowds. Kaikkonen’s art transcends the disciplinary boundaries between sculpture, installation and architecture. The interplay between the materials and the space builds up powerful and complex symbolic meanings in the works. Yet in spite of their profound complexity, Kaikkonen’s works are very approachable. Their references range from personal fates of individuals to great social upheavals and natural disasters, from religion and philosophy to environment issues and everyday life. One of Kaikkonen’s best known and most talked about works is Way, an installation made of old men’s jackets on the steps of the Helsinki Cathedral in 2000. With her original and uncompromising art, Kaarina Kaikkonen has become one of the foremost artists in Finland, and has attracted international attention with her worldwide exhibitions creating large-scale installations indoors and outdoors. Kaarina Kaikkonen was a guest at the Danish artist association Den Gyldne last year at Charlottenborg Udstillingsbygning. Kaikkonen has received an invitation to the Echigo-Tsumari Art Triennial this year in Japan, and is also doing displays at Påskeudstillingen, Tistrup, Denmark until May 21, 2006 and at The Crypt, Rochester Cathedral, Kent until May 29, 2006. Kaarina Kaikkonen aloitti uransa maalaamalla, mutta nykyisin hän toimii veistäjänä rakentaen usein installaatioita käytetyistä materiaaleista. Teoksissa sekoittuu elementtejä niin maalaus- ja veistotaiteesta, tilataiteesta kuin arkkitehtuuristakin. Kuva yli 3000:sta Helsingin Tuomiokirkon portaille levitetystä miesten puvuntakista levisi televisiouutisten välityksellä koteihin, ja puhutti suomalaisia kesällä 2000. Tie-teos johti osaltaan taiteen Suomi-palkinnon luovuttamiseen Kaikkoselle vuonna 2001. Kaikkosen taiteen lähtökohtana on usein ihminen, oma äiti ja isä – taiteilijan vanhemmat. Hänen teoksissaan aistii elämän ja kuoleman läsnäolon. Kaikkonen usa suas próprias experiências como ponto de partida para explorar a condição humana. Suas referências variam dos destinos pessoais às grandes convulsões sociais e às catástrofes naturais, assim como, das questões da religião e da filosofia às questões ambientais e da vida cotidiana. Além disso, seu trabalho com roupas usadas enfoca em infundir o espírito humano com ambientes através das peças de vestuário que parecem funcionar como vestígios de vidas passadas. Casacos velhos, sapatos e camisas assumem uma nova vida, às vezes triste, às vezes engraçada, mas sempre infundidos com um surpreendente senso de vitalidade. Casacos velhos tornam-se aparições que parecem flutuar acima das ruas das cidades, enquanto outros, revestidos de gesso, cobrem a beira do mar como se estivessem lutando pela vida. Sapatos de idosas se transformam em insetos, abrindo suas asas delicadas feitas das solas. Roupas usadas têm tanta vida quanto as pessoas que as usaram. As instalações de Kaarina Kaikkonen nos falam sobre o passado, o futuro, o diálogo, a comunicação, a relação entre a arte e seus arredores, a obrigação de preservar o espaço e dotá-los de uma nova vida e a obrigação de evoluir sem destruir.